At Delivery Biz Pro, we understand the plight that home delivery companies face. There is a delicate balance between making accurate and on-time deliveries, providing a high-quality product, and ensuring that your business still remains profitable through it all. When you’re focused on running your business effectively, integrating a brand new home delivery software is likely the last thing on your mind. However, it could be just the thing your business needs to optimize the ordering and delivery process for a more efficient service. 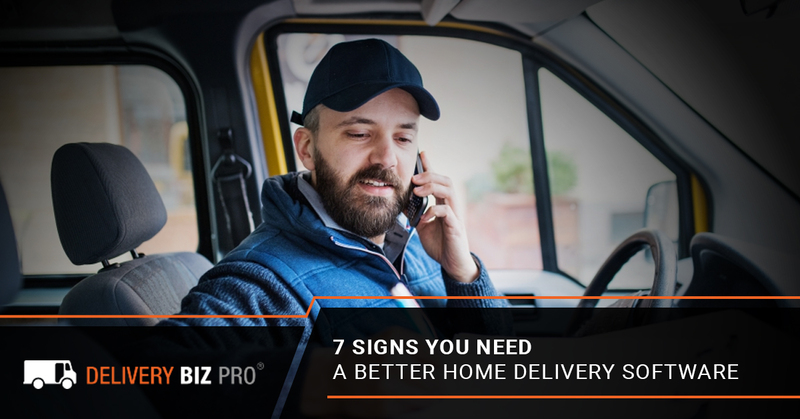 Below, we’re offering up seven tell-tale signs that it could be time to upgrade to a better delivery software. #1 – You hand plan driver delivery routes. Manually planning driver routes hasn’t been a necessity for years, yet many small delivery businesses still do it. Not only does this take up valuable time, but it also simply isn’t the best way to plan routes. Even if you know every street in your town like the back of your hand, an automatic route planner will be able to create routes that simply make the most logistical sense. Our software allows you to generate multiple routes to fit your needs, whether you want to create routes for certain neighborhoods or create routes based on the day of the week, our delivery routing software can do it in a snap. #2 – Your delivery costs are making you bleed money. Offering home delivery as part of your service should help you make profits, not lose them. Having exorbitantly high delivery costs that don’t align with profits could be a sign that your driver routes are far from optimized. #3 – You miss deliveries during busy months. If your delivery system is working out fine during average months but becomes a disorganized disaster during the busy season, it might mean that your driver routing system is unable to handle an influx of deliveries. This means that it also would not be able to handle regular business growth and you might find your business stagnating. #4 – Your drivers are unhappy. If your drivers are consistently unhappy or there is high driver turnover, you need to ask yourself why. Are they working overtime because there are too many deliveries and you can’t afford to hire another driver? Are they constantly scrambling to make sense of their delivery sheet or find the best route to the next house when there are a million other things to focus on? A good home delivery software will do more than just optimize your routes; it will empower your drivers. Your drivers are a cornerstone of your business model and they should be able to make the most of their time on the road. Our delivery driver software allows drivers to make changes on the road, edit order, mark deposits as returned or outstanding, take payments, skip deliveries, text customers with a delivery notice, and more — all on an easy-to-use tablet. Learn about our driver routing software today! #5 – Your home delivery system isn’t tailored to your industry. Home delivery businesses are vast and can range from monthly propane deliveries to weekly meal kit deliveries to daily dairy drop-offs and everything in between. If your delivery software isn’t cutting it, it might not be that it’s a bad software overall — it’s just a bad software for your business. Delivery Biz Pro is committed to providing a customizable delivery software that allows you to tailor dozens of features to fit your specific industry needs. #6 – You don’t have any statistics about how your delivery system is doing. Data is often a major driving factor behind business decisions. When delivery is a pillar of your business model, you need to be able to see real-time statistics about your orders, deliveries, revenue, and other vital key performance indicators. If your driver software cannot provide you with basic metrics that show where your company stands, it might be time to upgrade. #7 – You can’t meet your customers’ needs. What do your customers need from you? Obviously, they need the product you deliver, whether it’s farm fresh eggs or propane. But what else do they need? They need consistent and accurate deliveries. They need you to keep track of their milk jug deposits. They need to be able to skip deliveries if they’ll be out of town and they need to be able to throw a last-minute item into their cart. These are just a few things that customers need in their home delivery service, and if you can’t deliver (excuse the pun), then they’ll find a competitor who can. Updating to a better home delivery software can give you the tools you need to be able to meet your customers’ needs and desires. Ready To Optimize Your Delivery Business? We are ready to help! Our team is here to answer any questions you have about making the switch to Delivery Biz Pro. Fill out our short application today and we’ll be in touch as soon as possible to see if we’d be a good fit for your business model.